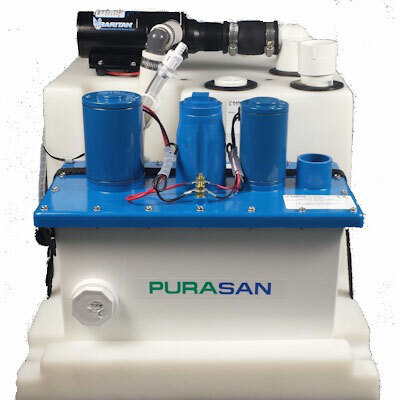 The Raritan 12 Volt DC Purasan EX Hold and Treat System is a total onboard, environmentally friendly waste management system for vessels up to 65 feet in length. Utilizing one of the best waste treatment technologies available, Raritan's system enables users to satisfy discharge regulations in all U.S. waters by combining a 15 gallon holding tank with Raritan's USCG certified Purasan EX Type I MSD system. Users can HOLD waste when required and then TREAT waste and discharge it when permissible using a simple control interface. Tablet replacement is cheaper than the original Purasan. Each tank includes two toilet inlets, two vents and one pump-out fitting for ultimate flexibility.